Fibromyalgia Awareness | Information, Tips, Support, Patient Stories: How to explain Fibromyalgia to people? Sometimes, people simply ask, "So what is the disease you have? What is it like?" 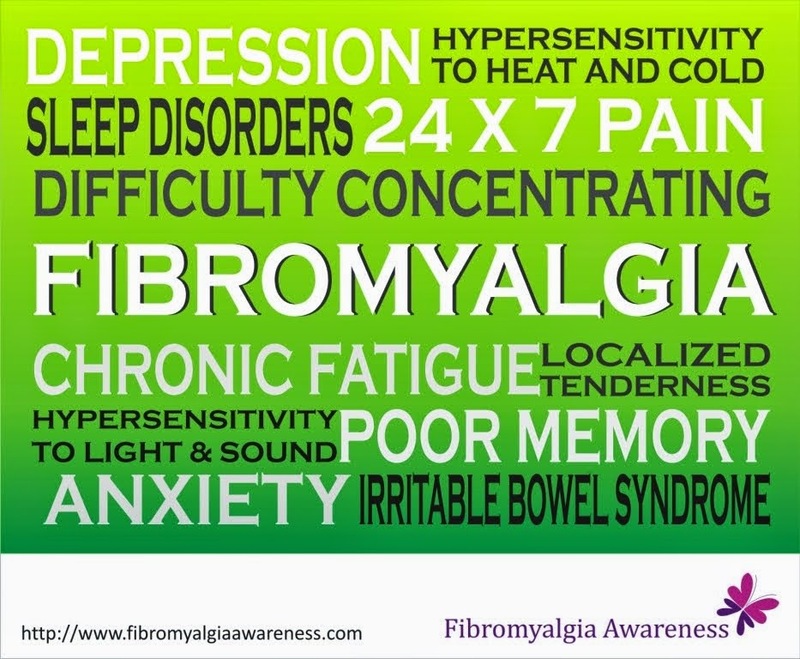 "I have fibromyalgia which essentially means I am in pain all the time along with many other symptoms ranging from sleep issues to memory problems to hypersensitivity to light and sound. My daily pain is like what one has when one is down with very high fever and bodyache which is quite tolerable for me now, but when I start mentioning that pain is bad, it means I should have been in bed many hours ago." "Please let me know if you would like to know about it in short or in detail. I really don't wanna bore you." That way I can describe as per the person's willingness. "Ever had an unbearable toothache? I have that kinda pain almost everywhere, all the time... that's just one of the symptoms of Fibromyalgia. I can't stay in the same position for long and definitely cannot overexert myself physically or emotionally. And there are so many 'simple' tasks that are really very difficult for me. There are a lot many symptoms and I can send you a link if you wanna know in detail." I have also written an article about Fibromyalgia on Half Baked Voices. It is ideal for those who have constant pain but are not sure what it could be or how to correlate the symptoms. Scroll down to the comments section to see what answers have helped our members. Have you tried explaining Fibromyalgia? What are your suggestions? Ya, that is a good way. Yes.. lots to explain. One thing I do is pinch a muscle on their leg or arm and ask when it hurts. Normal people take a lot of pressure before it hurts. Then I say.. I don't even put pressure on and it hurts on me. Then tell them it hurts INSIDE out. Bones ache.. I explain that it feels like I always have the flu. People can relate to the flu. I relate it to a REALLY bad 'Flu to explain the all over body aches, the crushing fatigue. But overall I agree that it depends on the relationship to the person asking. I think most of us agree that in general when people ask us how are in a single moment our response is "fine". You can tell the people who really know either you or know what Fibro is by their response of "No, how are you REALLY?" I have had very few people who actually knew that "fine" is a throw-away answer because we get tired of saying "I hurt, I'm tired, I'm exhausted, I'm depressed that I can 't do X, Y and Z..."
Cannabis helps with pain associated with Fibro. It's a shame it's not an alternative to everyone as an all natural holistic option. This is perfectly written. It's such a hard thing to explain. I tell people the pain/way you feel the next morning after working out at the gym that you havent visited for months + PLUS + the achy pain to the soul when you have the flu + PLUS + getting the crap punched/kicked out of you from head to toe -- all of this at the same time -- thats how a flare feels...like I could scream but the pain is so intense all I can do is scream, but either nothing comes out or my screams are too high pitched for human ears to hear. What a brilliant description by Anonymous above; it's exactly how I feel. I haven't really had many people ask what it's like and if I've ever tried to explain I see their eyes glaze over as soon as I attempt to get across how painful it is. Maybe this analogy might help me to describe this crippling, life-changing condition and make the lucky 'Fibromyalgia free' people more aware and sympathetic. I've started explaining it to be like arthritis of the muscles, being beat from head to toe and sleep deprivation. Everything that has been said is exactly how I feel. I explain things to the doctor they take more blood tests and nothing. I am so exhausted all the time. Every part of my body aches all the time. My memory is horrible, I eat to stay awake at work. I am so depressed that no one can explain what is wrong with me. Can someone tell me what kind of doctor to go to, to get some help please and thankyou!